Like it or not, winter is coming! Now is the time to start thinking ahead and making sure your house is ready for whatever storms blow through your area this year. These five steps take a bit of time and a few supplies. But if you take care of these steps in the fall, you won’t have to deal with supply and demand issues in the middle of winter when everyone else will be buying these items. Do it now, and then kick back and enjoy your winter evenings with a group of friends or a warm fire instead of worrying about a burst water pipe! Do you have double pane or single pane windows? 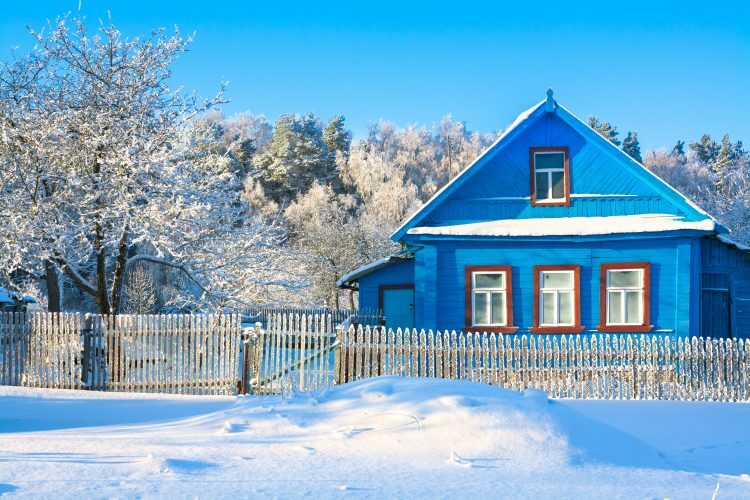 If you have single pane, your windows are going to take a bit of work to get ready for the cold. You have a couple of options. The more expensive route is to replace them with new, double-pane, energy-efficient windows. While this costs money, you may qualify for a tax rebate or assistance from your utility company to get the job done. It’ll bring long-lasting improvement to your home. However, windows are expensive. If those aren’t in the budget right now, pick up some window insulation kits at your local hardware store. These typically come with enough plastic and tape to cover multiple windows, so count how many you need before you shop. Then follow the directions to tape the plastic around each window. You’ll need a hair dryer to shrink the plastic for maximum protection against the cold. When water freezes, it expands as ice is formed. That ice can be devastating to your plumbing, causing burst pipes! To protect your pipes, you need to take a few minutes to ensure that any exposed pipes are insulated. There are several products on the market that vary in cost. You can pick up pipe sleeves to slide over exposed ends, or you can invest in heat tape. If your budget is really tight, tape several layers of newspaper over your pipes. This provides protection in areas with fairly mild winters. Once you’re done watering your garden and lawn for the year, remember to drain your hoses. If you have an in-ground sprinkler system, you’re going to want to drain those as well. Water left in hoses can freeze, causing the hose to split. You don’t want to have to replace them in the spring, so remember to drain. Power outages are an inconvenience. They’re also way more likely to happen in the middle of winter, when the winter winds can drop trees on power lines and wreak havoc on repair efforts. If your electric furnace is your only source of heat, you’re going to want to invest in a backup heat source now. A kerosene heater is one of the best options for emergency heat. The fuel burns clean and hot. However, you’ll have to ensure that you have kerosene on hand. If you prefer not to run kerosene, you can invest in battery powered infrared heaters. These put out a nice heat source as well. Just make sure to keep batteries around. When the roads are covered in snow and the wind is howling, the last thing you want to do is head to the store to buy groceries. Have these items on hand so you can eat even when there’s no power. While these items may not give you a completely balanced meal, they will keep you fed when you don’t have power to cook with. Bottled water is also essential—you can survive a lot longer without food than you can without water! These tips will help keep you prepared for whatever winter brings. Some will also help shave some money off your utility bills. For more money-saving tips, keep reading the iRazoo blog!